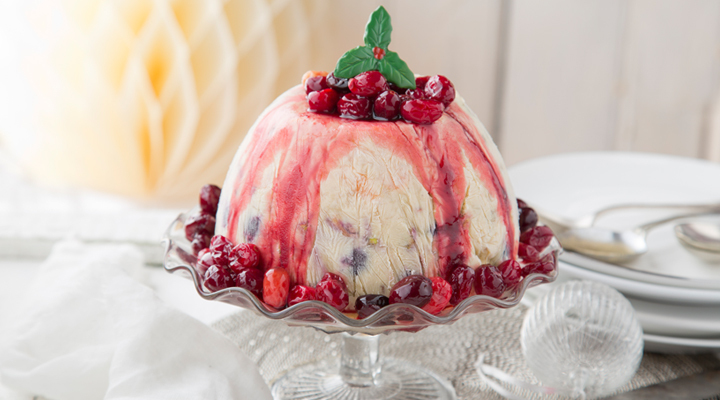 For those who aren’t keen on a traditional Christmas pudding or are looking for something different, give this icy version a try. It’s also much quicker to prepare, and while it can be prepared months in advance if necessary, it tastes just as great if prepared the day before it’s required. 1. Grease a 1.2 litre pudding basin with a little sunflower oil and line with a double layer of cling film, letting the excess hang over the edge. Alternatively, use a double layer of muslin, which leaves a pretty muslin pattern on the outside once peeled off for serving. 2. Mix the custard, raisins, sultanas and mixed peel together in a large jug until well combined. 3. Place the cream, icing sugar and spices in a large bowl and whip to soft peaks. Pour the custard mixture in and fold through gently until well mixed. 4. Drain the cherries through a sieve or colander over a small pan. Reserve the syrup and pat the cherries dry with kitchen paper. 5. Pour one-third of the custard mixture into the pudding basin. Place the clementine wedges in a single layer on top, followed by the pistachios and finally the cherries. Pour the remaining custard mixture on top. Cover with the excess cling film and freeze for at least 10 hours or overnight, until frozen solid. 6. Meanwhile, make the compote. Place the reserved cherry syrup in a small saucepan with the sugar and Cointreau or crème de cassis, if using. Bring to the boil over a high heat, stirring until the sugar dissolves, then lower the heat to simmer for about 10 minutes, until reduced by about half. Stir in the cranberries (which may cause the syrup to harden, but don’t worry) and continue to cook for a few minutes more, until the cranberries have softened. Remove and leave to cool completely. 7. Remove the pudding from the freezer about 30 minutes before serving. Invert a serving plate or cake stand on top of the pudding and turn it over. Remove the basin, running it under warm water to release it if necessary. Peel the cling film away, spoon the cranberry compote on top and serve. Tip: Use up any leftover Christmas cake or pudding by crumbling it into the custard instead of the dried fruits and peel.